From 3rd June 2017. Closes 25th June 2017. Suzanne Gummow trained as a Visual Arts Educator, lecturing in both secondary and tertiary education. She has been a dedicated teacher for over forty years, teaching in many different high schools in South Australia. Suzanne is currently teaching Visual Arts at Marden Senior College (an adult campus). She has written and lectured in a nationally accredited Certificate in Textiles. She also teaches private workshops in textiles, quilt making and art throughout Australia. In addition, Suzanne has coordinated, lectured and taught at many workshops in schools and adult education centres, judged at several shows and is an active member of many quilting/ art committees. She is an active member of SA and NSW quilting guilds. 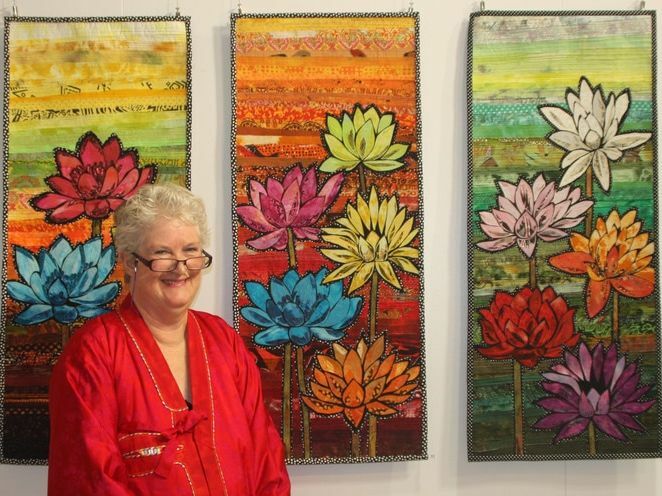 Suzanne was a Board member of TAFTA (The Australian Forum for Textile Arts and a committee member of Ozquilt Network. She is currently convenor of "Dare to Differ", a contemporary quilt exhibition held in SA and Fibre Artist Network in SA. She has been working with two exhibition groups, SAlt (South Australian Living Textiles) and Four X Four, both of which exhibit nationally and internationally. Her most recent exhibition has been with Four X Four in Perth during May 2017. What a quote and for me it is absolutely true. I must have flowers everyday. When I was a very small child I would look out my bedroom window to see rows and rows of daffodils, poppies, stocks and more…. These were growing ready for cut flowers that my grandfather grew to sell to florists. What attracted me to these flowers? The many colours, shapes and smells – these inspire me always – reds, pinks, yellows and every shade of colour that is in the colour wheel. My family owned and ran a plant nursery in Adelaide, South Australia and so plants and flowers were always there in abundance. I remember in the winter months the hot glass house was the place to be – exotic tropical plants and flowers including those of the insect eating type grew with magnificent foliage and colours. It was a warm place to spend a cold afternoon, it was pure delight. So, in the summer I would make my way to the shade house with its ferns, sprinklers that would be on, the wet and cool water running over my body. I would dart through the water and plants with glee on a hot day. My grandfather would often take me to the Botanical Gardens to visit the wonderful Victorian Palm House once again full of tropical plants, palms and ferns and we would also visit the Water Lilies when they were flowering – what a sight! These were and are very vivid memories from my childhood and obviously were the beginnings of my love of all things to do with plants and flowers. I travel regularly throughout the world but mainly to exotic places in the East and I photograph the gardens and flowers for future inspiration. I take hundreds of photos and sort them on my return on my computer into folders for easier access for future drawing and colour studies. My own large garden is a great inspiration for me too; it is full of flowers and plants. I am photographing it continuously. There are many other inspirations sources that I use for my flowers studies. They are Botanical books on flowers show the history and their structures and of course the wonderful Botanical Gardens throughout the world. The Singapore Gardens are truly magnificent and they have a beautiful display of orchids, where I have taken hundreds of photos. Other inspirations are taken from photographs in garden books, paintings, sculpture and drawings of flowers. Flowers are my passion and I have always use these as my inspiration to create artworks. From these photos I draw, draw and draw. A few years ago I embarked on a “Drawing A Day” project and of course my theme was “Flowers”. I drew every day for over a year and I still continue to draw nearly every day. At this moment I have over 10 A4 Visual Diaries full of flower drawings, which are used, as my inspiration for my future artworks. Drawing is an extremely important part of my art practice. Drawing develops your skills of observation and understanding of the flower. The more you observe the more you see. Drawing is the ‘Art of Seeing”. The more you draw the better you develop your skills. I proved this when applying drawing in the “Drawing a Day” project. Anyone can draw - it is continuous practice. Photographing and drawing are the beginnings of my art works. I start by searching through my Visual Diaries and pick the drawings and visuals, the photographs that are appropriate for the new art works. In most of the flower artworks I use a raw edge applique technique and the backgrounds are quilted with flower designs all based from my drawings and photographs. Using flowers with their wonderful colours and shapes give me a sense of wellbeing. I have to portray flowers always. 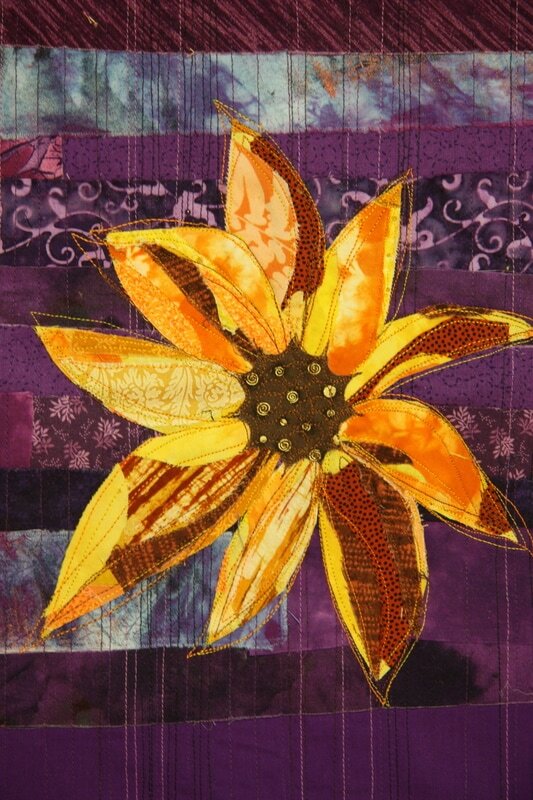 Suzanne Gummow raw edged applique, Suzanne loves large daisy-like composite flowers such as sunflowers and gazanias.